1. Soak dried fish in a bowl of water for 5-10 mins. 2. Heat olive oil in pan. saute ginger, onions, sun-dried tomatoes and garlic. Add 1 cup water and let it simmer. 3. 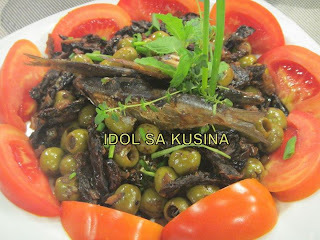 Add dried fish and olives. Sprinkle some ground peppercorn. Cover and let the dried fish simmer in tomato sauce for 5 to 8 minutes. 4. Garnish with green chilis. The food is absolutely amazing. I hope I could taste and cook that in actual, maybe if I have much time since I am so busy working. Anyways, thanks for sharing your article. God Bless and have a good day. Visit my site too.